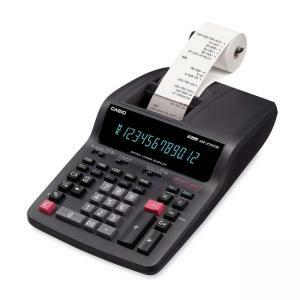 Heavy-duty calculator features a 12-digit, extra large, easy-to-read display as well as two-color printing on 2-1/4" paper. The two-color ink ribbon printer prints 4.8 lines per second. Functions include cost/sell/margin calculation, tax calculation, clock/calendar function, double injection key, decimal selector (6, 4, 3, 2, 1, 0 and A), item counter, independent memory, reference number printing, automatic constants, independent add register, grand total, markup/markdown, feed, right shift key, round off/up, cut off, and add mode. Calculator runs on AC. Weighs 3.7 lb.